Johannes Kepler (December 27, 1571 – November 15, 1630), a key figure in the scientific revolution, was a German Lutheran, a mathematician, astrologer, astronomer, and a professionally trained theologian. As a Pythagorean mystic, he thought of the universe as founded on mathematical relationships and forming an integrated whole. Thus, he applied terrestrial physics to celestial bodies. This approach was in contrast to that of Plato and Aristotle, who thought that the Earth was fundamentally different from the rest of the universe and operated under different natural laws. Many of Kepler's writings reflect his deep desire to understand the mind of God and to testify to God's glory, and he incorporated religious arguments and reasoning into his work. At the same time, he was committed to the scientific approach and was not tied to doctrinal beliefs. Even as a university student, he embraced and defended the Copernican Sun-centered model of the planetary system, although Ptolemy's Earth-centered model was still the dominant theory. In his early work, Kepler formulated a cosmological model in which the orbits of the planets were set in spheres separated by polyhedra, believing that it suitably depicted the Creator's handiwork. It is a testimony to his integrity as a scientist that when the evidence mounted against this cherished theory, he abandoned it. Based on his open mind and painstaking analysis of astronomical data, Kepler came to the realization that the planets move in elliptical—not circular—orbits. Kepler incorporated this understanding in his now-famous laws of planetary motion. Although he compiled astrological charts and made astrological forecasts, he disdained most of the astrology of his time, believing that a "scientific astrology" would eventually be developed. Kepler was born on December 27, 1571, at the Imperial Free City of Weil der Stadt (now part of the Stuttgart Region in the German state of Baden-Württemberg, 30 km west of Stuttgart's center). His grandfather had been Lord Mayor of that town, but by the time Johannes was born, the Kepler family fortunes were in decline. His father earned a precarious living as a mercenary and left the family when Johannes was 5. He was believed to have died in the war in the Netherlands. His mother, an inn-keeper's daughter, was a healer and herbalist who was later tried for witchcraft. Born prematurely, Johannes claimed to have been a weak and sickly child. Despite his ill health, he was precociously brilliant—as a child, he often impressed travelers at his grandfather's inn with his phenomenal mathematical faculty. Introduced to astronomy/astrology at an early age, Kepler developed a love for that discipline that spanned his entire life. At age five, he observed the comet of 1577, writing that he "...was taken by [his] mother to a high place to look at it." At age nine, he observed another astronomical event, the lunar eclipse of 1580, recording that he remembered being "called outdoors" to see it and that the Moon "appeared quite red." Unfortunately, childhood smallpox left him with weak vision, limiting him to the mathematical rather than observational aspects of astronomy. An abusive household and an absent and irresponsible father must have contributed to Kepler's introverted nature, to the extent that he experienced many of his greatest moments of joy in the contemplation of the order and beauty of the created world. His eyes, although imperfect, were perpetually searching the skies for answers to the riddles of the created universe. In 1589, after moving through grammar school, Latin school, and lower and higher seminary in the Lutheran education system, Kepler began attending the University of Tübingen as a theology student. At the university, he proved himself to be a superb mathematician. Under the instruction of Michael Maestlin, Kepler learned both the geocentric (Earth-centered) and heliocentric (Sun-centered) cosmological models. The geocentric theory, supported by Aristotle, had been given a mathematical foundation by Ptolemy and was widely accepted. On the other hand, the heliocentric model, advocated by Aristarchus, received little attention until Nicolaus Copernicus put it in mathematical terms. Inspired by Copernicus' work, Tycho Brahe's findings, and some of Plato's ideas, Kepler became convinced of the correctness of the heliocentric model. It appealed to his thinking that the Sun, as God's most brilliant creation, rightly deserved the central position in the planetary system. Thus, even at the university, he stood out as an iconoclast who critiqued the Ptolemaic system and defended the Copernican one, appealing to both theoretical and theological arguments in student debates. 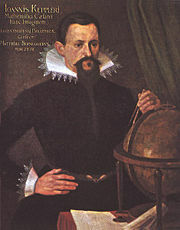 Despite his desire to become a minister, Kepler was recommended, near the end of his studies, for a position as teacher of mathematics and astronomy at the Protestant school in Graz, Austria. He accepted the position in April 1594 at the age of 23. As he began teaching in Graz, Kepler simultaneously turned his attention to asking questions about the reasons behind the number of the planets, the nature of their movements, and the structure of the created world in general. Motivated by his desire to understand the mind of the Creator, he formulated an original cosmological model, basing it on the Copernican system. In that model, he conceived of the planetary orbits as embedded in concentric spheres that were separated by perfect polyhedral shapes (see Mysticism below). His theory was published in 1596 as Mysterium Cosmographicum (The Sacred Mystery of the Cosmos). It is significant that he sent copies to Tycho Brahe and Galileo, among others. In April 1597, Kepler married Barbara Müller. In December 1599, Tycho Brahe invited Kepler to assist him at Benátky nad Jizerou, outside Prague. Tycho held the position of Imperial Mathematician in the court of Rudolf II von Habsburg, an emperor of the Holy Roman Empire, king of Bohemia, and king of Hungary. Kepler accepted the opportunity to work with the renowned Tycho for more than one reason. First, Graz was becoming an increasingly uncomfortable environment because policies of the Counter-Reformation led to intolerance of any ideas, especially Protestant ones, that deviated from traditional Catholic beliefs. The atmosphere of free inquiry and expression of opinion required for Kepler's scientific approach was no longer present in Graz. Second, the protection and financial security afforded by the new post at Prague must have seemed like a God-given opportunity to the Kepler family. Third, perhaps the most intriguing feature of working with Tycho was access to the best observational data of planetary movements available at the time. Kepler hoped that this data would assist him in his quest to unravel the mystery of the harmony of the universe, and he joined Tycho in 1600. At first, Tycho assigned Kepler to study the motion of Mars—a seemingly minor responsibility. Kepler used the opportunity to examine the behavior of both Mars and Earth and made a surprising discovery. Both planets moved faster when closer to the Sun and slower when farther away. The orbits and motions seemed eccentric. But how could that be? Was there a mathematical relationship that would explain in elegant fashion the handiwork of the Creator? Much to Kepler's delight, the orbital motions of the planets appeared to verify his theoretical postulate that there is a "planet moving force" flowing from the Sun. Kepler went back to Graz to learn that he and his family would be expelled. The Counter-Reformation was in full swing. The Kepler family made a hasty exit to Prague, where Johannes rejoined Tycho. For his part, the Dutch astronomer had been abandoned by several of his work group and needed Kepler more than ever. In a remarkable twist of fate, Tycho recommended Kepler to the emperor, became ill soon after, and died in 1601, leaving his precious data in Kepler's hands. After Tycho's death, Kepler was appointed to take his place as Imperial Mathematician for Rudolf II. He retained that post through the reigns of three Habsburg emperors (from November 1601 to 1630). As Imperial Mathematician, Kepler inherited Tycho's responsibility for the emperor's horoscopes, as well as the commission to produce Tabulae Rudolphinae (the Rudolphine Tables). Working with Tycho's extensive collection of highly accurate observational data, Kepler also set out to refine his earlier ideas about planetary orbits. In so doing, it soon became apparent to him that Tycho's data did not support a model in which planetary orbits were arranged according to concentric perfect spheres. He decided to abandon that model. Instead, he began developing the first astronomical system to use elliptical orbits, and he arrived at what became known as the first and second laws of planetary motion. The political backdrop to all that was going on for Kepler was one of great turmoil. While Kepler's star was rising, that of his patron, Emperor Rudolf II, was falling. The Austrian Habsburgs plotted and succeeded in dethroning Rudolf by encouraging Matthias, his younger brother, to advance upon Prague. Matthias was crowned King of Bohemia in 1611, and Rudolf died in 1612. To escape the carnage and turmoil his family had witnessed in Prague, Kepler took the post of provincial mathematician in Linz, a city in Upper Austria. While arranging the move, his wife Barbara died in 1611. Two children she had with Kepler and one by an earlier marriage outlived her. Moving to Linz was no panacea for an exhausted and disheartened Kepler. He had lost his wife as well as a stimulating lifestyle that had preceded the horrors of the sacking of Prague. Perhaps he sought to enjoy some peace and quiet in this provincial area of Upper Austria, but the tension between the Catholic Habsburg rulers and the local Protestant leaders was just as much a factor there as everywhere else at that time. To make matters worse, the Protestant leaders fought among themselves and Kepler, with his independent streak, was ultimately excommunicated. In 1615, Kepler married Susanna Ruettinger, with whom he had several children. Interestingly, he had set about choosing a bride in as systematic a manner as he could conceive, but in the end he settled on marrying a simple, provincial girl whose greatest recommendation was that she genuinely loved him. In 1617, Kepler's mother, Katharina, was accused of being a witch in Leonberg. Beginning in August 1620, she was imprisoned for 14 months. It appears that by going after Katharina, the local political and religious authorities were venting their anger against her son, who they considered a heretic, but who, as Imperial Mathematician, could not be prosecuted (Connor 2004). Thanks in part to the extensive legal defense Kepler drew up for her, she was released in October 1621 after attempts to convict her failed. She was, however, subjected to territio verbalis, a verbal terrorization that included displays of the instruments of torture that awaited her if she did not confess. Throughout the trial, Kepler postponed his other work (on the Rudolphine Tables and a multi-volume astronomy textbook) to focus on his "harmonic theory." The result, published in 1619 as Harmonice Mundi (Harmony of the Worlds), contained the third law of planetary motion. Kepler completed the last of seven volumes of his textbook Epitome of Copernican Astronomy in 1621. It brought together and extended his previous work and became very influential in the acceptance of the Copernican system over the next century. In 1627, he completed the Rudolphine Tables, which provided accurate calculations of future positions of the planets and allowed the prediction of rare astronomical events. On November 15, 1630, Kepler died of a fever in Regensburg. Two years later, his grave was demolished by the Swedish army in the Thirty Years' War. Kepler inherited from Tycho Brahe a wealth of the most accurate raw data ever collected on the positions of the planets. The difficulty was in terms of making sense of the data. The orbital motions of the planets are observed from the Earth, which is itself orbiting the Sun. As shown in the illustration below, this can cause the other planets to appear to move in strange loops. To understand the orbit of Mars, Kepler needed to know the orbit of the Earth accurately. For that, he needed a surveyor's baseline. In a stroke of pure genius, he used Mars and the Sun as his baseline. He realized that even without knowing the actual orbit of Mars, it would be in the same place in its orbit at times separated by its orbital period. His geometrical analysis needed only the ratios of the distances of the planets from the Sun, not the exact distances. 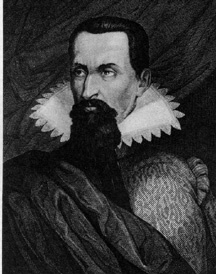 Historian of science William Boerst points out (in Johannes Kepler, Discovering the Laws of Celestial Motion) that Kepler was looking for both the accurate distance of Mars from the Sun and the period it took to move from one degree to the next. To do so, he meticulously divided the orbit of Mars into 360 segments. When he looked at the measured distances with the Sun at the center for each of the 360 degrees, the variance from an ideal circle was enormous. After five years of painstaking study of the Mars orbit, Kepler began to question his own belief that the orbits must be circular. Kepler's equal area law. If the time interval taken by the planet to move from P to Q is equal to the time interval from R to S, then according to Kepler's equal area law, the two shaded areas are equal. As Newton later showed, the planet moves faster during interval RS than during PQ because, as it approaches the Sun along QR, the Sun's gravity accelerates it. To attempt a description of the orbit of Earth, Kepler raised the question, how much time does it take for the planet to sweep out certain areas described by a line from Sun to Earth moving through a segment of the orbit? Through his analysis of the data, he discovered that planets sweep out equal areas in equal times. This became known as Kepler's Second Law of Planetary Motion. Mathematical order was preserved in this theory, which seemed to accurately represent the data obtained by empirical observation. Applying this law rigorously to the orbits of the other planets led him to what we now refer to as Kepler's First Law of Planetary Motion. Elliptical orbits were the only shape that fit the data accurately. Finally Kepler understood that the planets move in elliptical orbits, with the Sun at one focus. He abandoned the circular theory and wrote that he "felt like I had been awakened from a sleep." Kepler expounded these two laws in his book Astronomia Nova (New Astronomy), which was completed in 1606 and published in 1609. This book captured the imagination of Sir Isaac Newton more than a generation later. 1. Kepler's elliptical orbit law: The planets orbit the sun in elliptical orbits, with the Sun at one focus. 2. 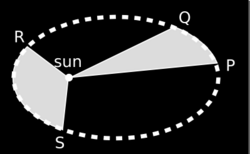 Kepler's equal-area law: The line connecting a planet to the Sun sweeps out equal areas in equal amounts of time. 3. 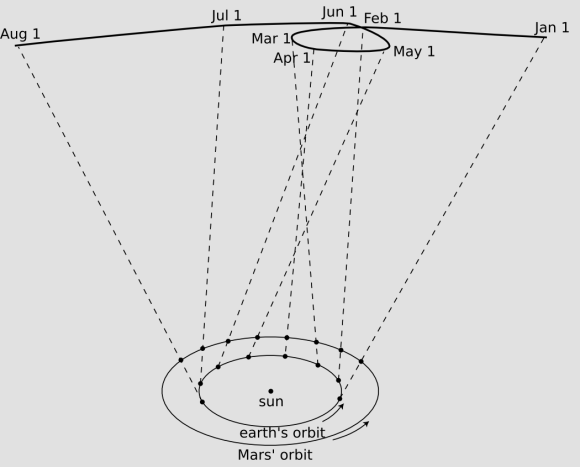 Kepler's law of periods: The time required for a planet to orbit the Sun, called its period, is proportional to the long axis of the ellipse raised to the power of 3/2. The constant of proportionality is the same for all the planets. Remnant of Kepler's Supernova, SN 1604. On October 17, 1604, Kepler observed that an exceptionally bright star had suddenly appeared in the constellation Ophiuchus. (It was first observed by several others on October 9.) The appearance of the star, which Kepler described in his book De Stella nova in pede Serpentarii (“On the New Star in the Foot of Ophiuchus”), provided further evidence that the cosmos is not unchanging—an observation that influenced Galileo in his argument. It has since been determined that the star was a supernova, the second in a generation, later called "Kepler's Star" or Supernova 1604. No additional supernovae have been observed in the Milky Way, though others outside our galaxy have been seen. Kepler also made fundamental investigations into combinatorics (a branch of mathematics), geometrical optimization, and natural phenomena such as snowflakes, always with an emphasis on form and design. He was also one of the founders of modern optics, defining, for instance, antiprisms and the Kepler telescope, as detailed in his books Astronomiae Pars Optica and Dioptrice. In addition, he was the first to recognize non-convex regular solids (such as "stellated dodecahedra"), which have been named "Kepler solids" in his honor. Kepler was a Pythagorean mystic who incorporated religious arguments and reasoning into his work. Thus, the basis for many of his most important contributions was essentially theological (Barker & Goldstein 2001). He considered mathematical relationships to be at the base of all nature, and all creation to be an integrated whole. This was in contrast to the Platonic and Aristotelian notion that the Earth was fundamentally different from the rest of the universe, being composed of different substances and with different natural laws applying. In his attempt to discover universal laws, Kepler applied terrestrial physics to celestial bodies. Moreover, Kepler was convinced that celestial bodies influence terrestrial events. One result of this belief was his correct assessment of the Moon's role in generating the tides, years before Galileo's incorrect formulation. Another was his belief that someday it would be possible to develop a "scientific astrology," despite his general disdain for most of the astrology of his time. Kepler discovered the laws of planetary motion while trying to achieve the Pythagorean purpose of finding harmony of the celestial spheres. According to historian of science James R. Voelkel (Johannes Kepler and the New Astronomy), he asked a unique question: "Why did God choose to construct the solar system in this way and not another?" Developing his ideas from the time he taught geometry in Graz, Kepler began to think it was not a coincidence that the number of perfect polyhedra was one less than the number of known planets. Having embraced the Copernican system, he set out to prove a model in which the distances of the planets from the Sun were given by spheres inside perfect polyhedra, all of which were nested inside each other. The smallest orbit, that of Mercury, was the innermost sphere. He identified the five platonic solids—cube, tetrahedron, dodecahedron, icosahedron, and octahedron—with the five intervals between the six known planets: Mercury, Venus, Earth, Mars, Jupiter, and Saturn. Kepler wrote to Maestlin, his old astromony professor, expressing his intention to publish this model for the glorification of God. He felt he had found his holy calling in a new venue and wept tears of joy over what he referred to as "stupendous miracles of God." Below are two excerpts from his publication Mysterium Cosmographicum, in which he explained the relations between the planets and the platonic solids. Kepler's "Platonic solids" model of the Solar system, as illustrated in Mysterium Cosmographicum (1596). Closeup of inner section of the model. 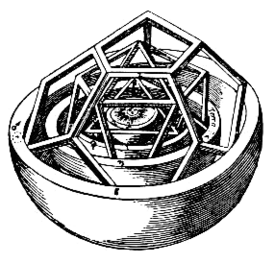 In his books Harmonice Mundi and Mysterium Cosmographicum, Kepler further associated the platonic solids with the classical concept of elements: the tetrahedron was the form of fire, the octahedron was that of air, the cube was earth, the icosahedron was water, and the dodecahedron was the cosmos as a whole or ether. There is some evidence that this association was of ancient origin, as Plato tells of one Timaeus of Locri, who thought of the Universe as being enveloped by a gigantic dodecahedron, while the other four solids represented the elements of fire, air, earth, and water. In 1975, nine years after its founding, the College for Social and Economic Sciences Linz (Austria) was renamed Johannes Kepler University Linz, in Kepler's honor, particularly because he wrote Harmonice Mundi, his magnum opus, in Linz. Kepler's attempts to fix the orbits of the planets within spheres separated by polyhedra never worked out. To his credit, he abandoned the theory when he realized that the astronomical data did not support it. His most significant achievements came from the realization that the planets move in elliptical, not circular, orbits. This realization was a direct consequence of his failed attempt to fit the planetary orbits within polyhedra. Kepler's willingness to abandon his highly cherished theory in the face of precise observational evidence indicates that he had a very modern attitude to scientific research. Kepler also took important steps in trying to describe the motion of the planets by appealing to a force that resembled magnetism, which he believed emanated from the Sun. Although he did not discover gravity, he seems to have attempted to invoke the first empirical example of a universal law to explain the behavior of both earthly and heavenly bodies. Kepler lived in an era when there was no clear distinction between astronomy and astrology, while there was a strong division between astronomy/astrology (a branch of mathematics within the liberal arts) and physics (a branch of the more prestigious discipline of philosophy). He, however, disdained astrologers who pandered to the tastes of the common man without knowledge of the abstract and general rules. He compiled astrological prognostications as a means of supplementing his meager income, but it would be a mistake to take his astrological interests as merely pecuniary. As one historian, John North, put it, "had he not been an astrologer, he would very probably have failed to produce his planetary astronomy in the form we have it." Kepler believed in astrology in the sense that he was convinced that astrological aspects physically and really affected humans as well as the weather on Earth. He strove to unravel how and why that was the case and tried to put astrology on a surer footing, which resulted in the publication, On the more certain foundations of astrology (1601). In The Intervening Third Man (1610), (a warning to theologians, physicians, and philosophers), Kepler posed as a third man between the two extreme positions for and against astrology, asserting that a definite relationship between heavenly phenomena and earthly events could be established. At least 800 horoscopes and natal charts drawn up by Kepler are still extant, several of himself and his family, accompanied by some unflattering remarks. As part of his duties as district mathematician to Graz, Kepler issued a prognostication for 1595 in which he forecast a peasant uprising, Turkish invasion, and bitter cold, all of which happened and brought him renown. He is known to have compiled prognostications for the years 1595 to 1606, and 1617 to 1624. As court mathematician, Kepler explained to Emperor Rudolf II the horoscopes of the Emperor Augustus and Muhammad, and he gave an astrological prognosis for the outcome of a war between the Republic of Venice and Paul V. In On the new star (1606), Kepler interpreted the meaning of the new star of 1604 as the conversion of America, the downfall of Islam, and the return of Jesus Christ. His De cometis libelli tres (1619) is also replete with astrological predictions. Many of Kepler's writings reflect his deep desire to testify to God's glory. On one occasion, he wrote, "I was merely thinking God's thoughts after him. Since we astronomers are priests of the highest God in regard to the book of nature, it benefits us to be thoughtful, not of the glory of our minds, but rather, above all else, of the glory of God." Demonstrating the humility that characterized his desire to develop a personal relationship with God, Kepler pondered, "Can I find God, who in the contemplation of the entire universe I can almost feel in my hands, also in myself?" Barker, Peter and Bernard R. Goldstein. "Theological Foundations of Kepler's Astronomy." Osiris 16: Science in Theistic Contexts. University of Chicago Press, 2001. Field, J.V. 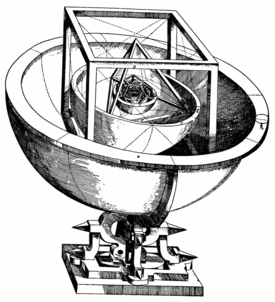 Kepler's geometrical cosmology. Chicago: Chicago University Press, 1988. ISBN 0226248232. Gingerich, Owen. The eye of heaven: Ptolemy, Copernicus, Kepler. New York: American Institute of Physics, 1993. ISBN 0883188635. Koestler, Arthur. The Sleepwalkers: A History of Man's Changing Vision of the Universe. 1959. ISBN 0140192468. Lear, John. Kepler's Dream. Berkeley, CA: University of California Press, 1965. Stephenson, Bruce. Kepler's physical astronomy. New York: Springer, 1987. ISBN 0387965416. Voelkel, James R. Johannes Kepler and the New Astronomy. New York: Oxford University Press, 1999. ISBN 0195116801. Banville, John. Kepler: a novel. London: Secker & Warburg, 1981 ISBN 0436032643 (and later eds.). Also published: Boston, MA: Godine, 1983 ISBN 0879234385. Draws heavily on Koestler's account of Kepler in The Sleepwalkers. "Kepler Space Observatory," a solar-orbiting, planet-hunting telescope due to be launched by NASA in 2008. "Kepler Solids," a set of geometrical constructs, two of which were described by him. 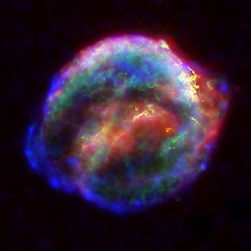 "Kepler's Star" (Supernova 1604), which he observed and described. "Kepler," a crater on the Moon, and "Kepler," a crater on Mars. This page was last modified on 12 May 2018, at 21:46.